Title IV financial aid is federally funded aid such as Federal Pell Grant, Federal Supplemental Educational Opportunity Grant (SEOG), Federal Perkins Loan, Federal Subsidized and Unsubsidized Direct Loans, TEACH grant and PLUS loans. The Department of Education requires that Title IV funds be applied only to specific allowable charges. Allowable charges are considered institutional charges. Examples of institutional charges are (but are not limited to) tuition, mandatory fees, lab fees associated with registered courses, room & board, and new student orientation. Examples of non-institutional charges are (but are not limited to) health insurance or other health center charges, fines for housing damages and library fines. If you choose not to authorize payment of non-institutional charges with Title IV aid, it is possible to receive a refund and yet still owe a balance to the College to cover these types of charges. William & Mary, in compliance with federal regulations, must obtain the voluntary permission from the student to apply federal financial aid proceeds to pay for charges related to a prior term, future term, or charges other than tuition, required fees, room and board, and other institutional charges. So how will this affect my account if I DO authorize William & Mary to apply excess federal Title IV financial aid to all non-institutional charges? If you accept, all charges on your student account for the current semester are available to be paid by these funds. Any funds in excess of your account balance will be refunded to you per The Bursar's refund policy. So how will this affect my account if I DO NOT authorize William & Mary to apply excess federal Title IV financial aid to all non-institutional charges? If you decline, then Title IV aid will only pay current tuition, fees, room and board. Other current term charges such as library fines and health insurance will remain unpaid this can result in registration holds that will stop you from accessing/requesting your transcripts, participating in add/drop and potential late fees from The Bursar's Office. So how will this affect my account if I DO authorize William & Mary to apply excess federal Title IV financial aid to Prior Year charges? 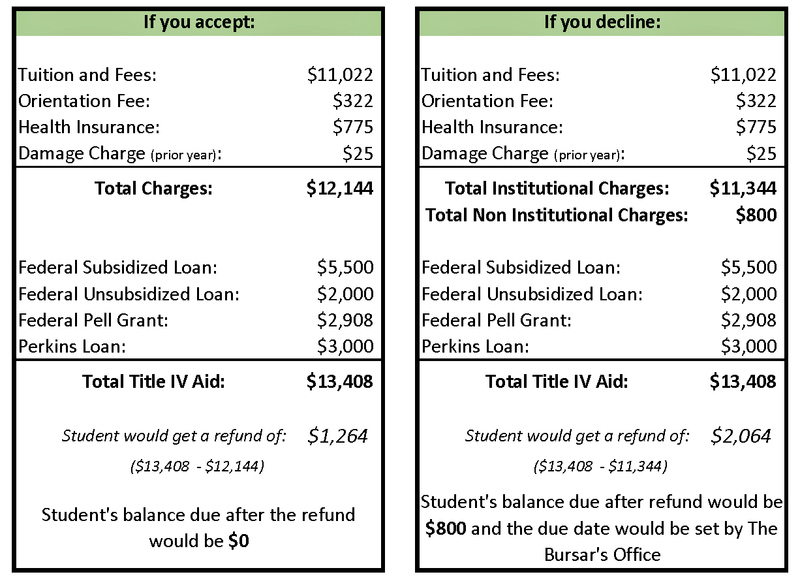 If you accept and allow William and Mary to apply Title IV financial aid to previous year institutional charges, then all charges up to $200 on your student account for the previous term are available to be paid with your current year Title IV funds. So how will this affect my account if I DO NOT authorize William & Mary to apply excess federal Title IV financial aid to Prior Year charges? If you decline, Title IV aid will only pay current academic year charges. If you have a balance on your student account after your current year charges are paid, you will have to pay any previous academic year charges with other funds. How can I make my determination of Title IV Authorization? You will log into the Banner Self Service Portal through my.wm.edu and select the “Financial Aid” tab. Next you will choose, “My Award Information” and then opt to view your “Award by Aid Year” (selecting the current financial aid year). There will be a tab for reviewing “Resources/Additional Information”, to the left of the “Accept Award Offer” tab. In the “Resources/Additional Information” tab, you will find the two questions regarding Authorization of Title IV funds. Once you submit your answer for the two question, then the “Accept Award Offer” tab should become active for you to access. No, by digitally accepting/declining this authorization, you are granting William and Mary authorization to comply with your response while you are a student at the College, including any breaks in enrollment. You may rescind your authorization at any time. How do I rescind or change my Authorization of Title IV funds? If, after providing your Authorization of Title IV, you wish to rescind or change your Authorization choice, you must complete the online form on the Bursar’s Office website. The link to the form is http://forms.wm.edu/32884. Can you show me an example of how my decision can affect my account? If you still have questions, please e-mail the Office of [[aid,Student Financial Aid]] or call us 757-221-2420.